And here it is the latest novel featuring Evelina Cooper. I was really curious to read it! I must say that we stayed pretty outstanding after such an end is the last book. Nick sank after an attack on his ship, Imogen has fallen into a state of the most intriguing and Evelina is now under the yoke of the man she hoped to escape. You can imagine that it leaves many questions! As always, we follow all the characters we met in the first volumes and as I said for the other novels, I’m always more interested in what happens in the life of our dear Evelina. I must say that it is always her who initiates things, liking it or not. A war is looming in the first two volumes and it will eventually explode here and this time our beloved heroine will be an important pawn in this game that no one can control. It’s pretty sad to see that despite her desire to continue her life as she wanted, it seems impossible. Her essence itself will change the course of history and our beloved heroine could become a person she never knew possible. But she isn’t the only one and it is the same for Tobias. He thought he could follow the orders of his stepfather, though remaining neutral in this war approaching, yet it will not be possible and each must ultimately choose a side. But whatever he does, all this will have serious consequences on his life and the one of his family. Of course, I also have to mention Imogen. I was surprised to see that she seemed fairly apart in the story and yet she will help more people than she would have thought. When everyone should confront what happens in London, she will fight her own demons, who by the way is none other than her sister Anna. But even if it seems simple, it will be much harder than anything she could have done before. The battle begins and it was very interesting to watch the fight and I admit that I was surprised more than once. I did not expect to see all the characters taking place in this fight by their own way. Each will have a major role and I’ll let you discover this in more details in the book. In any case I loved the whole story and I really enjoyed reading all the novels that the author presents here. I do not know if there will be a sequel, but the end is a good closure, although we have an opening if the novels continue thereafter. It was a truly original story and mixing it with steampunk is always very interesting. 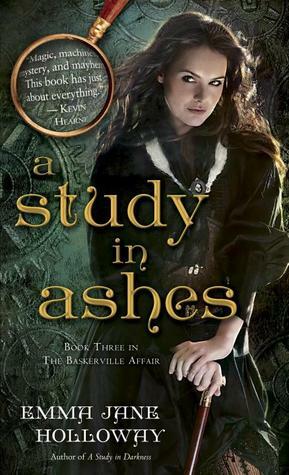 Sign into Goodreads to see if any of your friends have read A Study in Ashes.